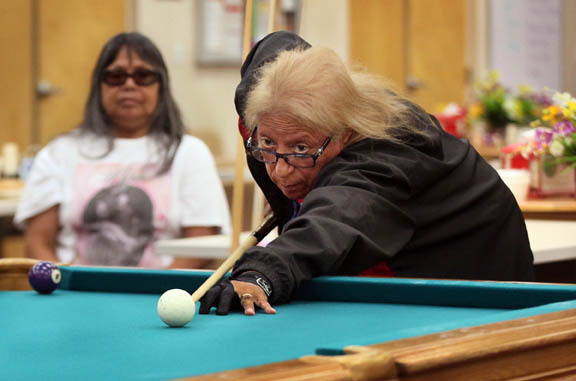 Louise Osceola concentrates on pocketing a ball Sept. 11 during a senior pool tourney in Big Cypress. 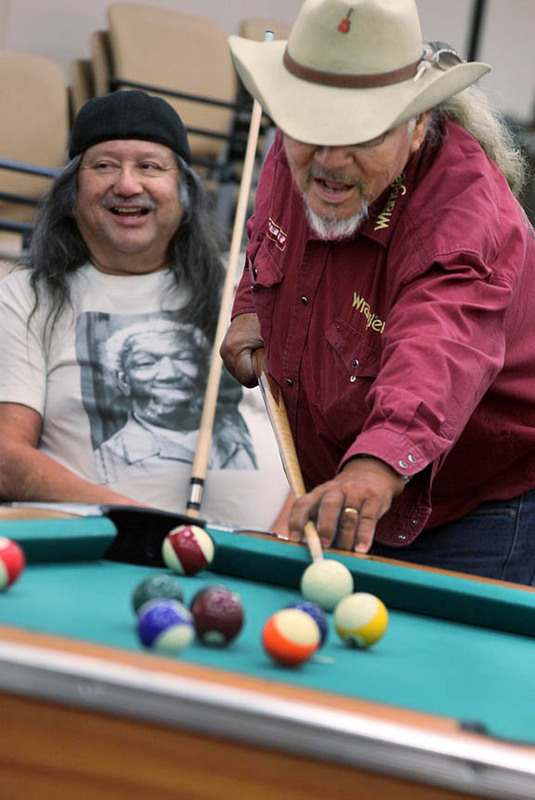 BIG CYPRESS — When it comes to playing pool, Big Cypress seniors are serious about winning, but mostly interested in hanging with friends and having fun. “It’s about friendly competition,” Laura Clay said. “And bragging rights,” David Cypress added. 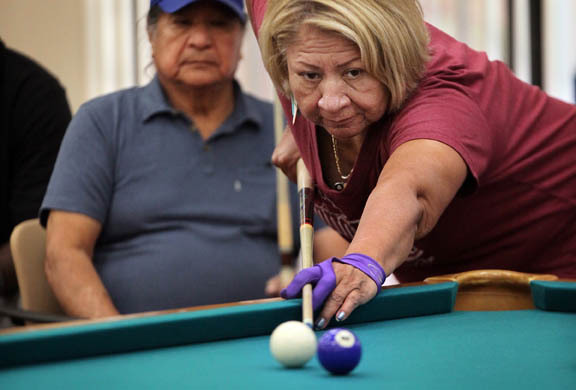 A group of nearly 20 seniors meets about twice per month at the Big Cypress Senior Center to put cue sticks to the table and knock balls into pockets during tournaments. Clay said some players have been pool buddies for decades. 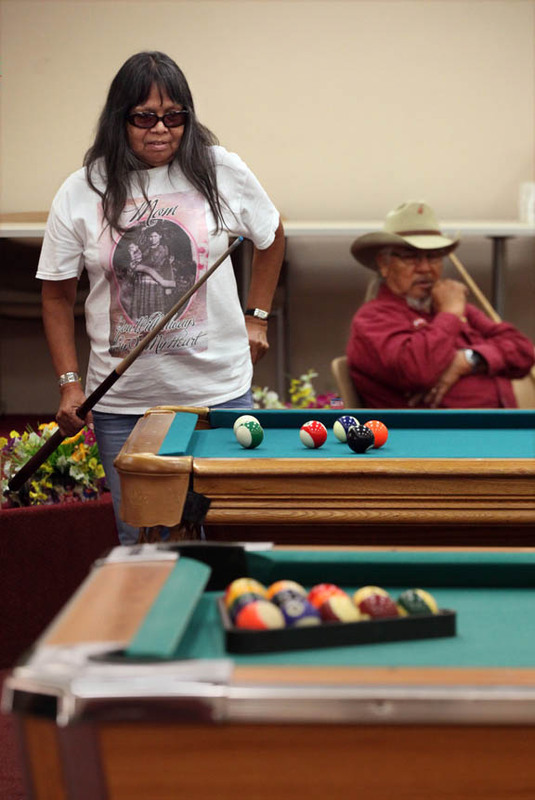 For many years scores of pool-playing enthusiasts turned out for the annual Randolph Clay Memorial Pool Tournament. “Now we get together only now and then,” she said. A handful of die-hard competitors are members of the Billiard Congress of America and play in leagues at Lucky 7 Billiards in Hollywood. 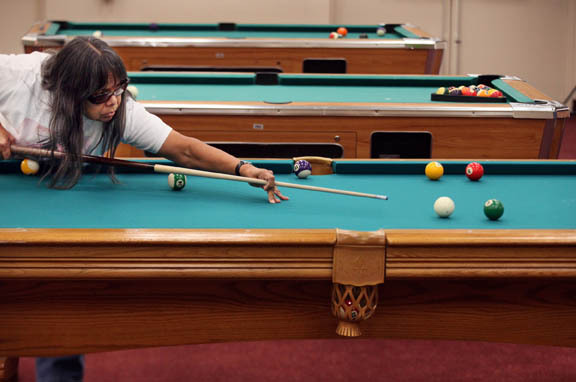 During a senior pool tournament Sept. 11, the group of longtime friends gathered in Big Cypress for a morning of men’s and women’s 9-ball and 8-ball and scotch doubles. Winners progressed in the double-elimination format. Some friendly trash talk kicked off the tourney, primarily among the men. 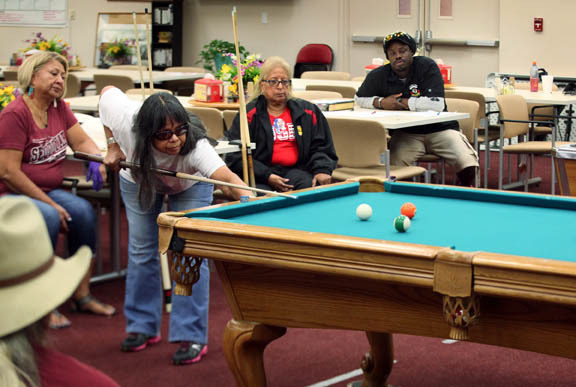 Cypress offered digs in the race to two 9-ball challenges, but Daniel Gopher placed first. Joe Billie took second place; Cypress came in third. Winners in the ladies 9-ball and 8-ball competitions were identical: Clay won first place, Louise Osceola placed second and Esther Buster captured third. Among the three teams in the scotch doubles tourney, first-place winners Clay and Cypress beat out runners-up Buster and Rudy Osceola. Louise Osceola and Billie finished last. “Really, we just want to get together so we can see each other,” Clay said.